SPPI is trading at levels last scene during the final leg down in 2002 from it’s year 2000 peak. Needless to say, it needed every bit of the past 18 years to grind out the investor euphoria excesses experienced during the heady final years of the “dotcom bubble” which took this stock as high at $675!! In today’s comparably more “civil” trading environment, HOLLY is noticing some things under the surface that has prompted her to issue buys in this stock on four separate occasions since the end of September when her first signal fired at $11.95 on September 28. There was a monster gap higher in October that SPPI attempted to “fill” in December, but the buying interest has simply been too strong to let that happen. And now buyers are pushing it back up near yearly highs as last week they clearly displayed who’s in charge. We can no longer sit and watch. Time to pay to play. 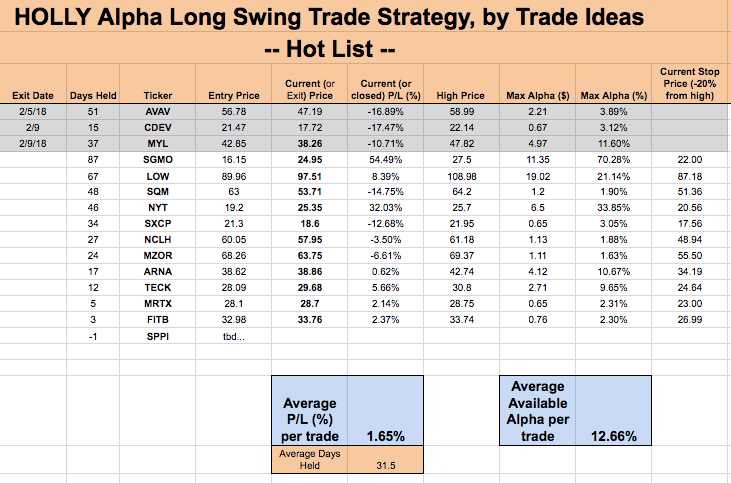 We’ll be adding SPPI to the HOLLY Hot List at the opening print of tomorrow’s trading (Tuesday, February 27, 2018). And the stock will remain in the portfolio until such time as we experience a 20% pullback from our highs. Each day over the past two weeks has put the “February Volatility Scare” further and further in the rearview mirror and the stock market looks like it wants to test new highs again soon. Obviously, this has been good for the long positioned portfolio. Thankfully, we were only stopped out of three positions in early February. Many of the remaining positions are looking good, especially SGMO and NYT.